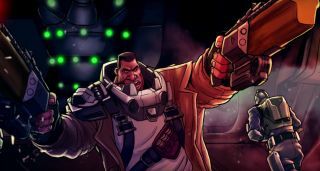 The tricky bit of wedging a story into a game like Battleborn is explaining why the 25 heroes charged with saving the universe from complete annihilation would put so much effort into fighting each other in the process. And that's not something these three videos—Running the Numbers, The Rescue, and No More Heroics—really dig into. Instead, they're all about how the disparate elements of the resistance come together for the last stand at Solus: A Shakespearean tale of madness, betrayal, duty, mistrust, and steadfast honor in the face of hopelessness. Okay, maybe that's overselling it a bit, but you get the idea: It's a classic case of “I don't like you and you don't like me, but unless we pull together on this the universe, and all life as we know it, is going to come to a cold, black end.” I can't say I'm all that terribly impressed with the production quality on display here, though, especially when compared to what Blizzard is doing with its own hero shooter, Overwatch. Hopefully the game will be better! We'll find out soon enough: Battleborn will be out on May 3.